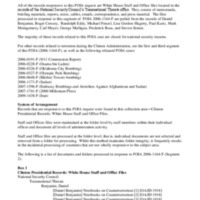 Identifier is exactly "2006-1164-F Segment 2"
This is the second segment of a collection consisting of records dealing with terrorist attacks during the Clinton Administration and the counterterrorism policies put in place in response to those attacks. The collection contains records from the files of the staff of the Transnational Threats Directorate in the National Security Council and includes memorandums, briefing papers, reports, notes, cables, emails, correspondence, and press material. Topics addressed include legislation, preparedness reports, aviation security, Presidential Decision Directives (PDDS) 39 and 62, and the investigations of the Oklahoma City Bombing, the Riyadh bombing, the Khobar Towers bombing, the U.S.S. Cole bombing, and abductions of westerners.